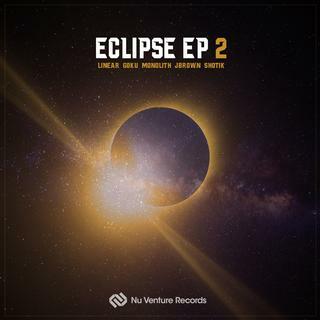 Following on from the success of the original release featuring Jam Thieves back in 2013, Nu Venture Records present the second installment of the series; Eclipse EP 2. This deep dark and dirty 6 track Drum & Bass EP, includes return NVR artists Linear and Goku, also welcoming new release artists Monolith, J Brown, Shotik and Talabun. A big track demonstrating a heavy and dominant bassline, on top of a more minimal beat and the gritty vocals of Talabun. The drums intentionally have a low tempo, allowing for a greater focus on the main elements of this track; 808 subs, the intense reeses and the dark pads. Definitely a track to get the crowd down low so be sure to turn up the bass dial for this one! Hidden opens with complex spliced breaks, on top of deep sub bass and synthetic yet ambient and melodic sounds. The track then shifts up a gear into an unrelenting chorus characterized by distorted bass stabs and cut-up drum breaks. Hidden was written as a homage to the unique mystical atmosphere of classic X-Files episodes. What Style sees Linear take aim squarely at the dance floor. The Tension mounts in the intro until the drop hits, packed with low-end power and fizzing high-end energy. Subtle variations and switches keep the listener alert whilst maintaining powerful simplicity. The breakdown offers a short pause for breath before the second drop plunges us straight back into the action. Keeping the darker theme flowing, Why So Serious begins in timeless fashion, with orchestral melodies setting the tone for a high intensity reese bass drop. Also showcasing stomping drums and deep basslines to make this one for the bass heads and tech lovers alike. The intro resonates dark and murky sounds smothered in spacious reverb, with production and the track title being inspired by long lost Mesopotamian ancient civilizations. Ishtar then progresses into a slightly off-beat minimal groove with deep and smooth sub bass, also showcasing glistening synthesizers to complete the overall feel of the track. Resulting in a chilling vibe that combines modern drum sounds with classic production techniques reminiscent of the early days of Drum & Bass. Beginning with a haunting cinematic intro, to set a dark soundscape for an all out amen assault, on this heavy hitting track. Dirty reese bass works perfectly alongside heavy sub shaking stabs to compliment the old skool amen vibes. Keeping an orchestral feel throughout this one was created to make the speakers vibrate and get the dance floor moving.